Please see below important information from the Harbour Master / Marine Safety of the Department of Transport, Fremantle in regards to Tropical Cyclone Riley at Port Walcott. Thank you all for your communications over the past few days and your preparations for the TC RILEY. BOM advice as of 14:46 today is that TC RILEY (Cat 1) is located about 140 nm west/northwest of Broome heading west/southwest at about 8 knots. Expected to continue moving west/southwest parallel to the Pilbara coast this evening and tomorrow. TC RILEY likely to intensify to Cat 2 during this evening and then possible to Cat 3 tomorrow. Depending on exact track of the cyclone, gale force winds may be experienced along the mainland Pilbara coast Saturday morning. Preparations are made in accordance with their respective cyclone contingency/response plan. The wharf areas are inspected for and cleared of any items that may have the potential to fall into the berth pockets or adjacent areas during periods of strong winds. Port Facility and Terminal Operators in the Port of Walcott should ensure that their cyclone contingency plan has been enacted, and that vessels at their facilities have done likewise. Port Facility and Terminal Operators in the Port of Barrow Island should ensure that their cyclone contingency plan has been enacted, and that vessels at their facilities have done likewise. Port Facility and Terminal Operators in the Port of Varanus Island should ensure that their cyclone contingency plan has been enacted, and that vessels at their facilities have done likewise. Port Facility and Terminal Operators in the Port of Cape Preston should ensure that their cyclone contingency plan has been enacted, and that vessels at their facilities have done likewise. Port Facility and Terminal Operators in the Port of Onslow should ensure that their cyclone contingency plan has been enacted, and that vessels at their facilities have done likewise. Please see below important information from the Harbour Master / PSO of Pilbara Ports Authority of Dampier in regards to Tropical Cyclone Riley – Update 7. 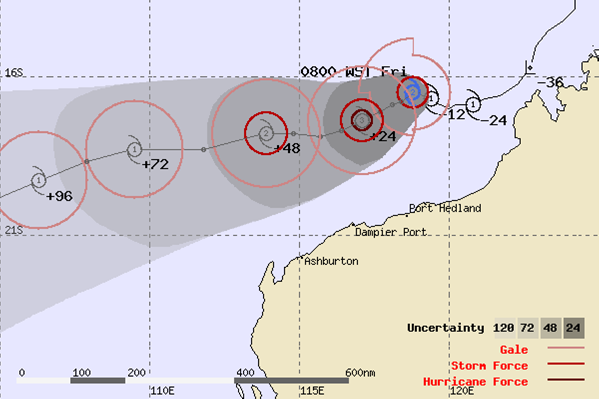 As per latest BOM forecast the tropical cyclone Riley is currently located offshore North of Port Hedland. The tropical cyclone is likely to move in a Westerly to a West-South-Westerly direction and expected to reach a Category 3 intensity tropical cyclone on Friday evening. The Port of Dampier is forecasted to experience Northly swell in excess of 1.0m height and may also experience Gale force winds as a result of this Tropical Cyclone in the next 24 hours. The weather forecasts will continue to be monitored with further advice to be issued on 25th Jan 1600 hrs or earlier if there is a substantial change/escalation to the situation. • All anchorages have been cleared. • Rio Tinto, Dampier Salt, King Bay Supply Base, Toll terminals have been cleared. • Bulk Liquid Berth and Dampier Cargo Wharf have been cleared.